WaterBob (Emergency Water Reserve) [WaterBob (EmergencyWaterReserve)] - $24.95 : NewDaVincis.com!, Great Innovative Products, Gadgets and more. Never wait in line again to buy expense bottled water! Have plenty of water for your entire family for drinking, cooking, washing and flushing. The WaterBOB? 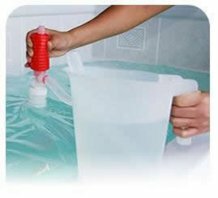 turns any standard bathtub into an emergency water reserve, storing up to 100 gallons of fresh drinking water. When an emergency arises simply lay the WaterBOB? in your bathtub, hookup to the faucet and fill to capacity. A siphon pump is included to easily dispense the water into jugs or pitchers. The WaterBOB? follows FDA guidelines and is constructed of heavy-duty food grade plastic. When you are ready for water, remove the center nozzle cap and thread on the siphon pump by turning in a clockwise motion. You will need to pump several times to begin the siphon effect. To stop the water flow, loosen the vent cap located on top of the pump. When fresh water is no longer needed, slit the side of the liner and drain the remaining water. Dispose of the empty bag and please recycle. To keep the water fresh, close any window treatments and place towels over the liner to block sunlight. During a hurricane or tropical storm, water main breaks and storm surges can interrupt or even contaminate your water supply. When clean drinking water is unavailable it?s more than just inconvenient, it can become life threatening. Every household should have the WaterBOB for temporary water storage during emergency situations and after disaster relief. Purchase a WaterBOB? for your family and friends and for each bathroom in your home. Clean water is a top priority. Be prepared with the WaterBOB!